It may have been a Rest Day from my Turbo Fire workouts but it wasn’t a No Workout Day. I moved my Long runs to Wednesdays (the rest day for my Turbo Fire) because it was just too draining for me to do a long run And a longer Turbo Fire workout on Fridays. Going to bed early last night was just what my body needed to help me get through run today. 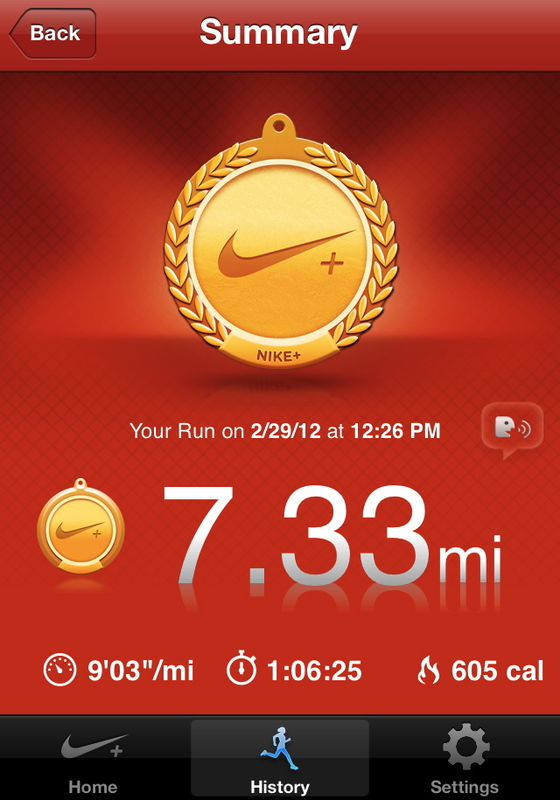 I really love my Nike+ app. I love how I can “challenge” myself by going farther or faster. I did 7 miles last week so I decided to go for 7.3 miles today. The beginning is always the hardest part for me. After getting myself out the door, the first 10-15 minutes is mentally challenging. The thought of how far I have to go intimidates me and a part of me wants to stop right away. I think about things I want to do and things I have to do to keep my mind busy. Once I get past that part, I’m usually somewhere else mentally so I’m not thinking about running. I’ll focus on the music or the scenery. I just run. When I get to the halfway point, I get a second wind and feel pretty good. Towards the end, I start to feel it physically and I have to tell myself I Can Do It – I’m Almost Done – Just a Little Bit Further – Just Keep Moving – Don’t Stop…. And when I finish, I feel Great that I made it without stopping. I always feel like I’ve won a huge mental battle. I Beat the voice that told me to Stop and Quit! I don’t worry too much about the time. Today, I needed to finish in time to pick Gio up though. I finished just in time to do a stretch, pull on my sweats and coat, and head out. I had to walk since Ben had my car (which had the car seats). I brought my chocolate Zico to drink on the way. I swear that stuff is Best post run drink ever! We walked back home and my legs were pretty worn out. After helping Gio with homework, I took a nice long shower. It felt absolutely amazing. I did some stretching while in the shower to help my legs out. I wish I could have stayed in there all day. That’s all I’m doing for today – except for my plank. Going to try to get bed at a decent time tonight. 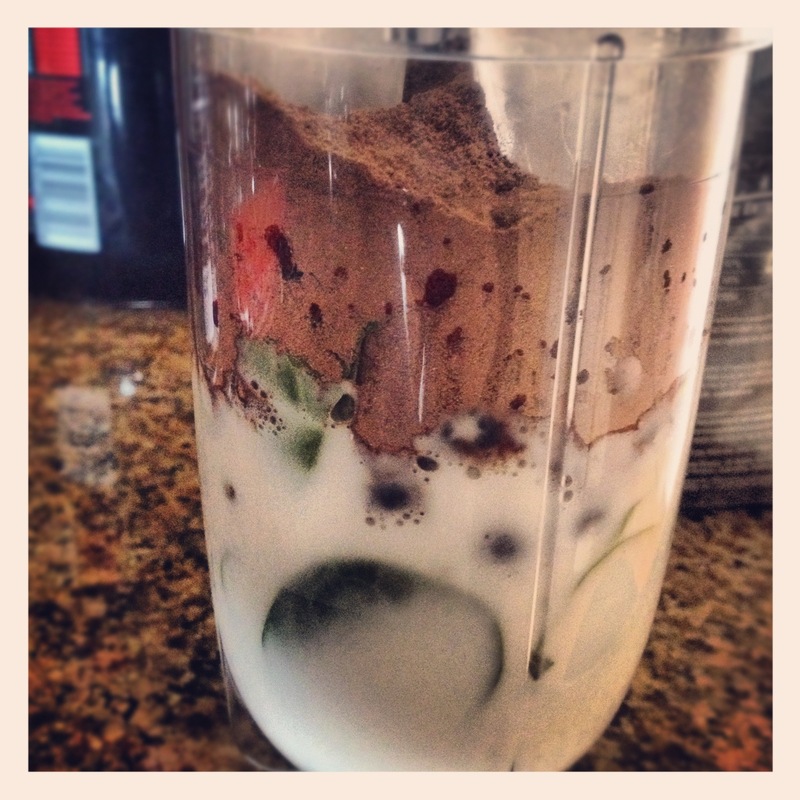 M3: Chocolate Shakeology with spinach and frozen blueberries. 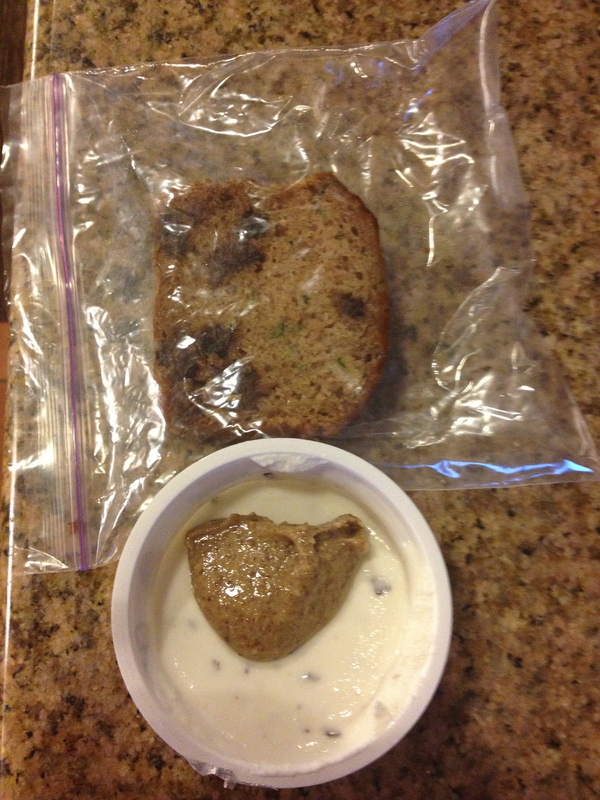 I can’t even taste the spinach at all and this was so filling. If you hate eating greens, seriously adding it in a shake will help :-) Also had some Snapea Crisps. 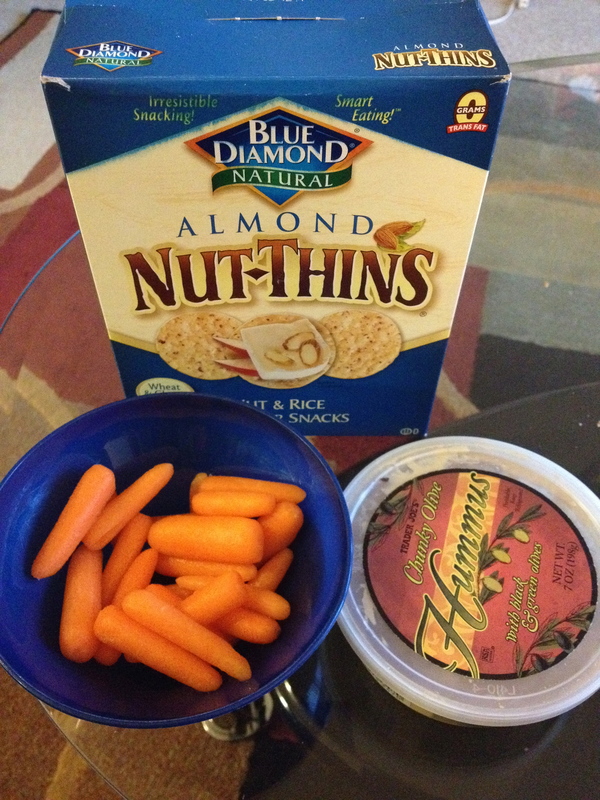 M4: Carrots and Nut Thins with Chunky Olive Hummus. Just had a little bit of Nut Thins left so I decided to finish it. 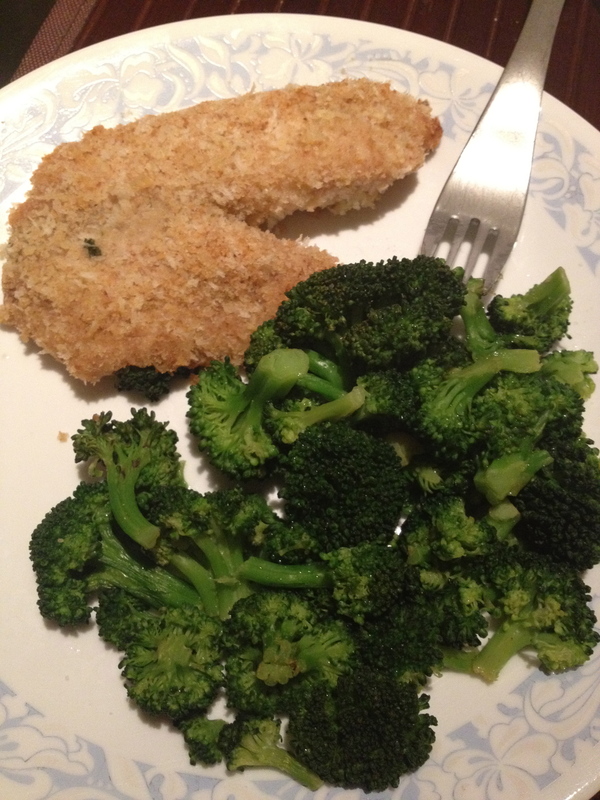 M5: Panko Tilapia and broccoli. 60 oz. of water. Had a Zico during my run and a chocolate Zico post run.